This is a continuation of a series for those of us who are wanting to make the leap from run of the mill hunter, to hunter extraordinaire. 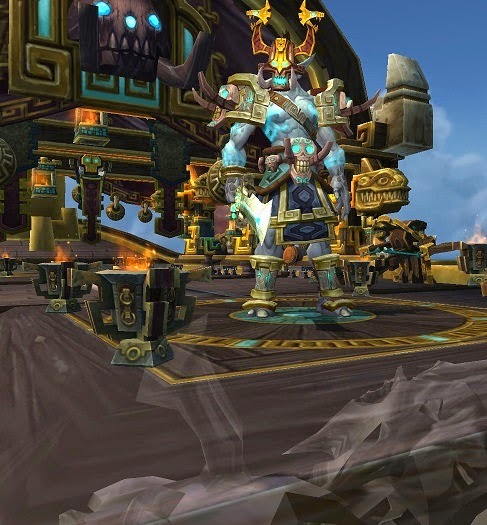 We'll be going through soloing that isn't quite in the realm of "extreme soloing", but is beyond the grasp of the average WoW player. Toward the end of expansions it seems the AH markets die off pretty quick; especially in MoP where there's so much free catch up gear. One of my favorite little farms is War-God Dokah. For some reason, people on my server don't bother farming War-God Dokah. I've only ever, that I recall, run into one other person up there, and since he respawns every half hour, there's plenty to go around. For me, however, he's on my "anytime I have a spare minute" list of things to do, because he's a great gold maker, and he's great for farming resources. The Dinomancers you have to kill to get to him drop tons of the pets, which vend for 62g50s, so even if you don't have a good pet market on your server, they give you a fine chunk of change. They also, for hunters only, drop plenty of Ancient Tomes of Dinomancy, which vend for 37g50s each. Then the War-God himself drops 4-16 Stolen Insignias for the various pandaria faction, which only vend for 17g50s each, but tons of them drop. The other huge benefit of these, is they are account bound, so if you say, just started a baby hunter on another realm or in another faction, you can send these over so they can start with some gold in their pockets. Then finally, he drops a big bag and a small bag, which will contain resources for one or two professions. To solo this guy, you will want to be fairly geared. 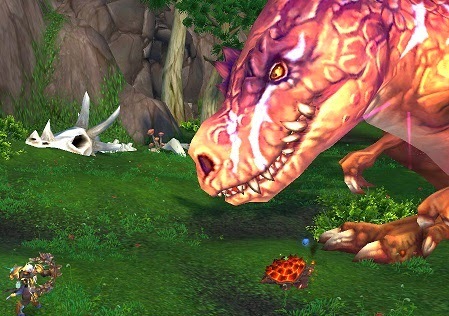 If you're over 530 ilvl, your pet should be able to handle his melee, but there is a sort of "enrage timer", in that the dinomancers around him respawn quite quickly. He has 42m health, so to kill him in 3 minutes you'll need to do about 235k dps. To kill him in four minutes, which will be pushing the respawns, you'll need 175k dps. If you perhaps slept through patch 5.2, the War-God can be found on that big ship off the southeast shore of the Isle of Giants. Swim out, and before you jump up there, hit your camo and you can walk right by that big ol' dino. Once inside the lower deck of the ship, MD to your pet and hit barrage, you can pull the whole room at once. They're worth killing for the tomes and pets that will most likely drop. On the upper deck you'll do the same thing, just be careful with your barrage so you don't pull the War-God while you have 15 dinomancers to deal with . There are 4 in a line that are pretty close to the War-God, so I'll generally put my pet on passive and pull them individually from max distance, so I don't chance hitting the Dokah with my cape proc. Once the dinomancers are dead and looted, you'll probably want to start on Dokah immediately, so as to not run into the dinomancers respawning. Scarabs--he summons some scarabs, which can be taken out without switching targets with a quick multi-shot, or if they're too spread out, with a barrage. The only consideration here is don't barage toward the northwest side of the boat, or you'll have a giant devilsaur coming at you. Meteor Shower--he summons some meteors. This won't affect you much, they're a problem for casters who can't move, but we can easily out-range them, so just get out of the way. If you do get hit, they won't hurt bad, however. Horrific visage--he'll cast this on whoever has aggro (your pet) and they'll be feared. It can be annoying because it can line of sight both Dokah and your pet. If you see this being cast, make sure you refresh Mend Pet, in case your pet gets in a spot where you can't heal her. It can happen that it'll send your pet downstairs, but I've only seen it once, you should only have a couple of dinomancers to deal with if your pet does pull any, though. Shouldn't be a big deal. Thunder Crush--only effects melee, and doesn't hurt your pet, so just make sure you don't stand in it. Vengeful Spirit--this ghost lady will 2 shot your pet, so keep your pet away from her. She's quite slow, but you'll need to move 50 - 60 yards (or 3/4 the length of the boat) for her to despawn before she gets to you or your pet without having to move twice. If you're BM, you can't afford to lose so much dps while you're pet kites her, so make sure you take aggro when she appears, then you can kite her around while your pet tears up the war-god. Keep Dokah's aggro on your pet. Keep glyphed Mend Pet up at all times. If he casts scarabs, AoE them down. If he casts Vengeful Spirit (which has a significant cast time), go ahead and /petmoveto all the way to the other side of the boat. And Pew Pew. It might take a couple tries to get used to the managing the Horrific Visages (if you're BM you can save your BW for this and negate them), but other than that, it's quite straight forward. Pew Pew, collect loot! And once you're done, fight some giant dinos!